See the lineups, comparisons and callouts for all 6 classes, all awards through to the OVERALL AWARD to Kevin Nguyen, MEN’S PHYSIQUE CHAMPION for 2018. The second part of this DVD contains the full event of the 2018 International Sports Hall of Fame Inductee Ceremony. KEVIN NGUYEN WINS OVERALL MEN’S PHYSIQUE TITLE! 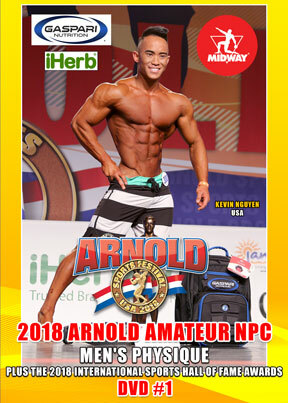 Kevin Nguyen of USA won the overall Men’s Physique title as more than 600 of the top amateur competitors from around the world competed in 10 divisions at the 12th Annual Arnold Amateur NPC International Championships. YOU MAY ALSO ORDER AN HD VIDEO FILE OF ANY CLASS OF YOUR CHOICE INCLUDING THE CLASS AWARDS, TO BE EMAILED TO YOUR INBOX, US$35 PER CLASS. The Inductees were Drs Terry and Jan Todd, Bas Rutten, Ronda Rousey and Phil Keoghan. The awards also include Ronda’s mother AnnMaria DeMars.